Are you looking for Daddy Daughter pictures or the winning SuperBowl Commercial Competition videos. How about building a Dream Box, learning to skateboard or do you want to solve a Murder Mystery? Check out all that is going on now at the Arts Barn. For details on events check out past posts. 1. Daddy Daughter Dance Pictures for both sessions are now posted. 2. 2012 Super Bowl Commercial Competition Winners and videos are now posted. 3. 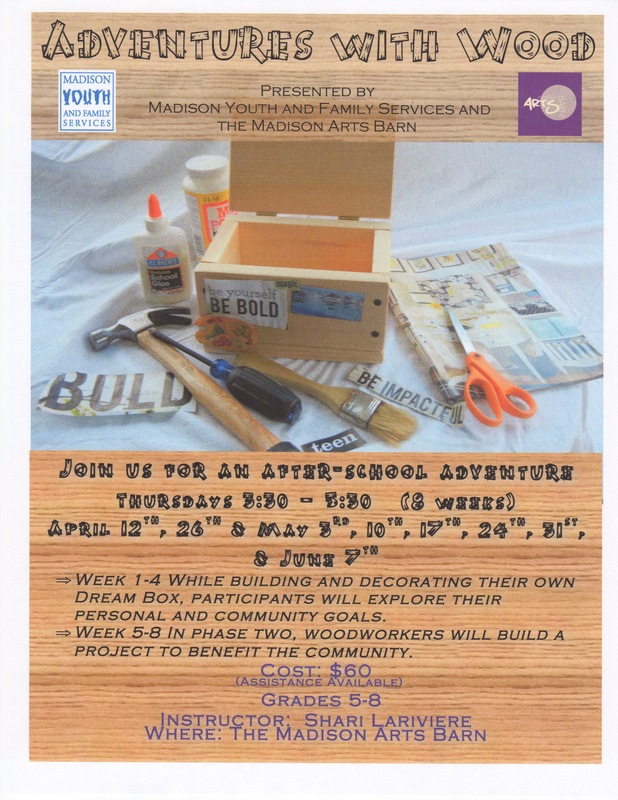 Adventures in Wood – Sponsored by Madison Youth & Family Services and the Arts Barn – 8-week program, beginning March 29th changed to April 12th where participants explore their personal and community goals while building and decorating Dream Boxes. 4. Creative Creations – Monday evenings beginning April 2nd at the Arts Barn. Come help us create our next big event. Help with decoration and sets. Creative skill is appreciated but not necessary. Currently working on building the town of Cactus Gulch for the Murder Mystery Dinner. 5. Skate Camp for beginners – Week of April 2nd (changed to April 9th) come learn the basics of skateboarding. 6. Magic Card Tournament – April 2nd – Open to High School Students. 9. Skate Workshops for Intermediate Skaters – Tuesday and Thursdays beginning April 24th for two weeks. 10. Murder Mystery Dinner – April 28th from 6:00 – 8:30 PM. Come visit Cactus Gulch and help us find who killed Dusty Jones, the owner of the goldmine. Community event open to everyone! 12. Kid’s Energy Expo – Come join us to experience a day exploring. Exhibits include; make your own smoothie, make your own trial mix, yoga, karate, dream interpretation, chair massage, personal training, Didgeridoo, Skateboarding, Shaman power animals, reflexology, angel card reading and more. Any questions or if you want to get involved let us know. Hope to see you at the Barn soon!